16.1 million Americans provide unpaid care for people with Alzheimer’s or dementia, according to the Alzheimer’s Association. Caring for someone with dementia can be demanding and stressful if you’re not sure what to expect. If you are caring for a loved one with dementia, the following 5 dementia caregiver tips can help with your day-to-day responsibilities and overall care. #1. Encourage your loved one to eat right: People living with dementia should consume a healthy diet filled with fruits and vegetables. Proper nutrition is key to keeping their body strong and healthy. Remember that nutritious meals may become a challenge for people with dementia because as their cognitive function declines, they may become overwhelmed with too many food choices, have difficulty using utensils, or forget to eat altogether. And poor nutrition may increase behavioral symptoms as well as cause weight loss. You – as the caregiver – should also eat right. Eating a healthy diet can go a long way toward warding off dementia, and it can also reduce the risk of developing additional health problems including heart disease, heart attack, stroke, cancer and diabetes. FirstLight Home Care’s Companion Care services can offer support by assisting with grocery shopping, meal preparation and more. #2. Do things that make them laugh: Laughter is therapeutic. Research has shown that laughter is beneficial to those with memory loss. It can help reduce stress, blood pressure, and make your loved with dementia – and you – feel better. #3. Create a serene, clutter-free home: Clutter around the home can be stressful. It’s important to create an environment where your loved one living with dementia can feel rested. Look around the home, reduce unwanted clutter and put things away. Also determine the key rooms your loved one uses most and consider painting them a subtle color. Avoid leaving the television on all day for background noise and instead play soothing music. Naturally scent the home with fresh flowers, a diffuser, or floral scented wax bars. Aromatherapy can bring a sense of calmness to the home. #4. Encourage physical exercise: Research has proven that being active can slow down brain aging. Other studies have found that a sedentary lifestyle increases the probability that dementia will set in. When you exercise regularly, it stimulates blood circulation to the brain. Assisting the person you care for with a daily cardiovascular workout for at least 20 to 30 minutes a day can result in clarity and help bring their surroundings into greater focus. #5. Take care of yourself: When caring for someone with dementia, you are bound to experience many sometimes difficult emotions: grief, anger, boredom, fatigue, fear, anxiety, frustration. It is important, as the caregiver, to stop and care for yourself. 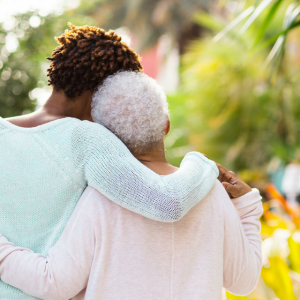 Caregiving is a demanding job, and if you’re caring for someone at the expense of taking care of yourself, it could lead to unintended consequences. Not paying attention to your personal happiness and fulfillment can create resentment over time as you continue to put others’ priorities ahead of your own. Ask other family members to help so that you can have some personal time. If they are unable to step in, hire FirstLight Home Care. Our Respite Care Services can make a difference in your life. If you are caring for a family member living with dementia or Alzheimer’s disease, learn how FirstLight’s Dementia Care Program can give you peace of mind and make a difference in your loved one’s care. If you have other helpful dementia caregiving tips that you want to share, join the conversation on our Facebook page.